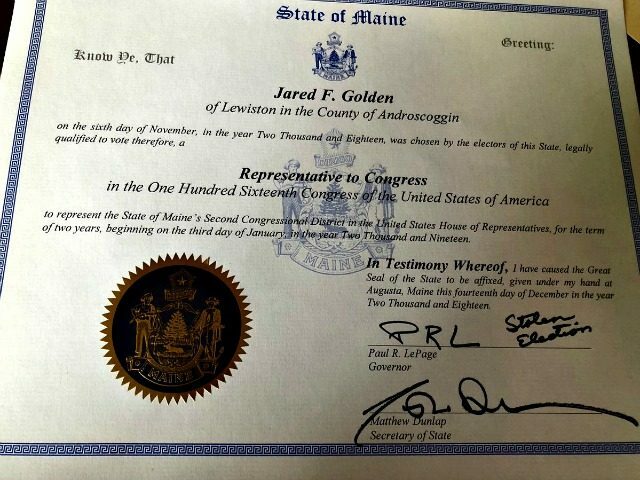 Golden won the election to Maine’s 2nd congressional district after two-term incumbent Rep. Bruce Poliquin (R-ME) conceded on December 24, ending a legal challenge contesting the election results. The controversy in the congressional election stemmed from Maine’s “ranked choice” voting system, which allows voters to rank their candidates in the order they prefer. But if neither candidate wins the majority of votes, the votes are tallied a second time and voters’ second and third-choice preferences are added to the voting total. In this case, Poliquin initially led the race by 2,000 votes but was short of winning an outright majority. Golden then leaped ahead of Poliquin in the polls after election officials tallied voters’ second preferences from ballots listing two independent candidates as the first choice in the recount. Golden won 50.5 percent of the vote while Poliquin pulled in 49.5 percent of the vote after the recount, the Portland Press-Herald reported. Poliquin called the move unconstitutional and took the matter to court. He asked the court to hold another election or declare him the winner. LePage is stepping down as governor in January due to term limits. Janet Mills, a Democrat who served as Maine’s attorney general, will replace LePage in January. The outgoing governor told reporters in November he would be getting out of politics and relocating to Florida to take advantage of the state’s low taxes.